The key to the trade turn out to be relief pitcher Ron Perranoski. He went 7-3 with a stingy 2.65 in 53 games as a rookie for LA. He led the National League three times in games, 1962, 1963 and 1967. In 69 appeances in 1963 he led the NL in winning percentage with a splendid .842 pct - posting a 16-3 record with a miserly 1.67 earned run average. An All-Star Ron Perranoski played a major role in the Los Angeles Dodgers successes during the 1960s. Don Zimmer was an aggressive standout player and was Brooklyn's backup shortstop to PeeWee Reese for 4-years, 1954-1957, before taking over that infield slot when Reese retired. 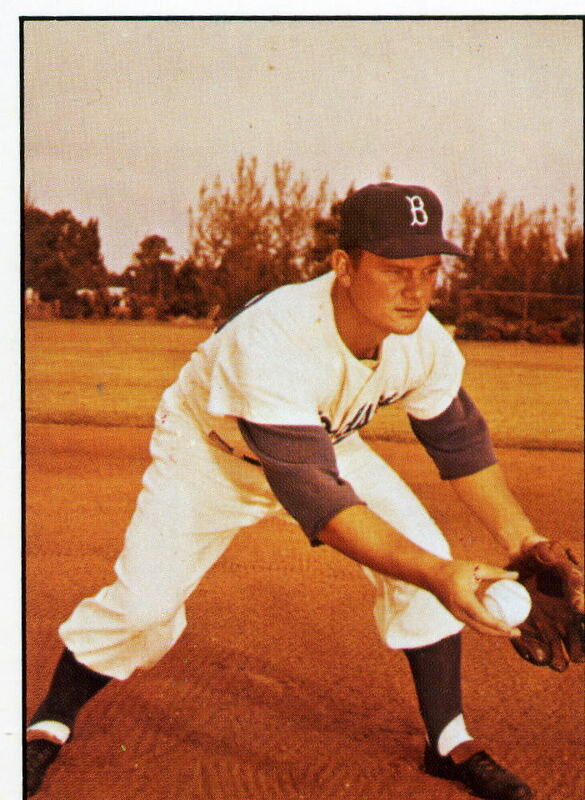 Zim, as he was called by his teammates, went with the Dodgers when they moved to Los Angeles in 1958. That year he lined 17 homers. In 1956 he was beaned by pitcher Hal Jeffcoat and suffered a serious checkbone fractured. He played in the majors until the end of 1965. He later coached and managed in MLB. Johnny Goryl played for the Cubs, 1957-59, but was sent to the minors by the Dodgers and did not play again until 1962 with Minnesota. Lee Handley was a quick moving infielder and a fans favorite for many years with the Pittsburgh Pirates, and proudly served in the US Military during World War 2, 1942-1943. Height / Weight: 5' 9" / 177 lbs. The Los Angeles Dodgers traded long-time fans favorite Don Zimmer to the Chicago Cubs for third baseman John Goryl, rookie pitcher Ron Perranoski, and infielder Lee Handley.